Whether you’ve been keeping up with video game news as of late or not, chances are you have probably heard someone in your life mention cowboys, the Old West or Red Dead Redemption 2 (RDR2). Rockstar Games, the studio behind the ever-successful Grand Theft Auto series and a multitude of other top-tier titles, have a storied history of consistency and excellence when it comes to their video games. Looking at everything that makes a video game memorable — a compelling narrative, realized characters, addictive gameplay, eye-catching visuals and an unforgettable score — Rockstar, along with a select few other game developers, have nailed what a video game experience should be. With RDR2, the new standard of excellence has been set. A Western-themed action-adventure epic, RDR2 is a prequel to Rockstar’s beloved Western tale of, for lack of a better word, redemption. The first Red Dead Redemption, which was released in 2010, tells the heartbreakingly human story of John Marston, a former outlaw who is forced by government agents to track down members of his former posse, the Dutch van der Linde gang. RDR2 hyper-focuses in on the van der Linde gang and what life is like for an outlaw during the dying days of the Old West. Red Dead Redemption was a massive critical and commercial hit and is often in the conversation for best video games of all time. As a result, any sequel would have nearly impossible expectations to live up to. RDR2 not only smashed expectations and delivered on every front, but it holds a special place in video game history due to the unique experiences literally everyone who has played the game can attest to. But why is it so good? What makes a video game good? It’s a subjective discussion that I don’t think anyone can really give a correct answer to. But for me, I know RDR2 is one of the best games of all time due to the hours of discussion I have had with friends outside of the game. When the game came out nearly two weeks ago on Oct. 26, I expected to play a couple hours here-and-there, text my friends that it was a fun game and move on with my life. Instead, I was so engrossed with the world RDR2 creates that I barely texted my friends that weekend. I was either playing the game, or thinking about playing the game. Critic reviews were rolling in and they also loved it, but I didn’t expect this silly cowboy game to dominate discussions for the foreseeable future. In all honesty, I’ve probably spent as much time talking to people about RDR2 as I have actually playing the game, which is a truly fascinating thing to think about. But that’s exactly what happened. Anyone who purchased and played the game felt the same way as I did, but it was never for the same reasons. Sure, we played some of the same missions and did similar Old West activities, but those weren’t the moments we were talking about. We were talking about the moments where a stranger would approach us on horseback and boast that their steed would decimate ours in a race to the cliffs of El Diablo. We’d talk about the moments where we’d find a weeping woman in the middle of a crocodile-infested swamp, try to console her and be ambushed by her machete-wielding compatriots. We’d talk about brushing past a grizzled ranch hand, getting his leg crushed underneath a cow and days later, seeing the same ranch hand with an amputated leg. In all honesty, I’ve probably spent as much time talking to people about RDR2 as I have actually playing the game, which is a truly fascinating thing to think about. This virtual experience, that took nearly a decade to create, is so detailed and immersive that everyone I’ve talked to has a favourite experience that is different than mine. For people who don’t really play video games, that rarely happens. There’s usually some sort of consensus when it comes to favourite characters or favourite moments. In RDR2, my favourite character so far — a sleazy, snake oil salesman who has been poisoning men and wooing their widows — was in the game for maybe 15 minutes. My friend’s favourite character — a drunk fur salesman — is just a random character living in the world. Another friend’s favourite is Leopold Strauss, a shifty, money-lending businessman who controls the van der Linde gang’s cash. Again, I could go on forever. The game really is an anomaly when it comes to the entertainment medium. I have never consumed a film, a book or a piece of literature, spoken about it with someone and had such wildly different experiences. Sure, some people love Star Wars and some hate it, but it is the divisiveness that generally brings about these hour-long discussions. When it comes to RDR2, hour-long discussions stem from unique experiences in the same magical world. The random encounters with eccentric characters are unreal and the characters themselves act like real people, but none of that would matter if the game wasn’t fun to play. I can assure you, the game is fun. 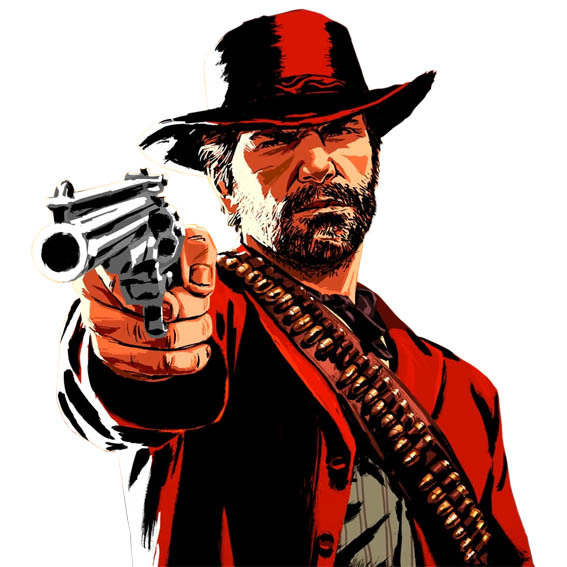 Whether it’s breaking into a stable in the dead of night, stealing a stagecoach and selling it to a disgruntled relative or happening upon a camp of enemy gang members, only to meticulously choose the right weapon for the job and unload a hellish-fury of cowboy violence, the gameplay is fun through and through. But, most of all, the attention to detail is what puts RDR2 into the upper echelon of video games. Let’s say you want to go hunting because your camp desperately needs provisions to survive a harsh blizzard in the mountains. You’ll pick the right horse, craft the correct materials and trek through mounds of snow until you happen upon a clearing where two pristine, white-tailed doe are desperately searching for their own food. All of a sudden, just as you’re cautiously approaching your camp’s next meal, a pack of wolves emerges from the trees on their own hunting trip. You fend off the wolves with whatever weapons you were able to bring with you, desperately trying to catch your next meal in the process. Then, it’s over. Blood-stained snow surrounds you and you’ve managed to fend off the feral pack. But, you’re too injured to continue the hunt, so you head back to camp. A few in-game days later, the camp is clinging on to their last few rations of canned peaches and baked beans. You set out upon the same trail, tracking those two white-tailed doe again. You happen upon a clearing, where you find the decaying carcasses of those same wolves that attacked you days earlier. That level of detail is unheard of in gaming and it genuinely brings a smile to my face every time I have to brew my own coffee, change my clothes because they’re covered in mud or take a bath because I’m filthy. These everyday, mundane tasks are what makes a game like RDR2 feel lived-in and completely realized. As I write this, it feels as if the world that my character inhabits continues to live on without me. Bartenders will continue to pour shots of whiskey, the newspaper vendor will continue to callout to passers-by and the van der Linde gang will continue to evade the law. All in all, playing RDR2 feels like the first time I watched a movie like Apocalypse Now or The Shining or picked up and read Blood Meridian. It’s these special forms of entertainment that manage to spark a new passion for the genre as a whole. It’s these excellent pieces of work that up the standard and make the rest of the industry raise the bar themselves. So, I honestly want to thank the developers of RDR2 for making me fall in love with video games the way I did when I was a kid. But, enough words. I’m going to go play some more Red Dead.